Remember the day when a cupcake was just a cupcake? A person peeled the paper off and just ate it. Simple and good. For Halloween we made chocolate cupcakes with orange frosting. Woo! Or should we say, "Boo!" Today it's not so simple. Bakeries are going out of their way to make the most interesting concoctions with the wildest flavors and appearances and their customers are eating them up! 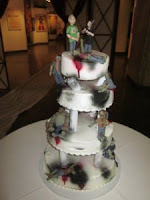 It is a cut throat baking world out there--no pun intended, and things are getting creatively scary. Sweet Avenue Bake Shop in Rutherford, NJ has a "True Blood" cupcake called "Fangtasia." It is a cherry liqueur cake filled with cherry pie filling and topped with vanilla buttercream. When it is bitten into, it oozes out like blood, while more "blood" drips from the top of the buttercream. It actually looks quite appetizing, but that could be from my days of being a night-shift phlebotomist. No, we don't want real blood, but any bakery could give Twilight fans a Cullen cupcake, however, and they will scarf it down, if nothing else but because it's a "Cullen" cupcake. Sweet & Tasty Bakery in McAllen, TX once made a giant alligator cake that stretched 4 feet long, colored dark green, with sharp teeth and high gloss. POP Bakery in the U.K. has a cake pop with the painted face of Kiss bassist and vocalist, Gene Simmons, in full makeup including tongue sticking out. Is it filled with "blood?" I don't know, but that would be a nice additive for that particular cake pop. They also make chocolate skull cake pops and a huge variety of intricate, beautiful designs that are so incredible a person would almost not want to eat them (but we all know we would). Many bakeries on Facebook are making cake pops with scary faces painted on them including the stereotypical "evil" witch, aliens, and many, many zombies. This Halloween, do something different for your party and stay away from the plain cupcakes with orange frosting. Ask your baker to create something wonderfully scary but scrumptious to delight or frighten your guests--whichever you prefer.